From the Baroque style architecture of Stockholm Palace to the National Museum with over 6000 paintings, there are reasons why Stockholm is fast becoming an interesting cruise ship port and city to visit, especially on one of our Stockholm shore excursions! Stockholm is the capital of Sweden and is full of Nordic descent, fascinating culture and UNESCO World Heritage Sites. The city first became a powerful point in Europe during the 17th century. Its Old Town, founded in 1252 and known as Gamla Stan, is one of the best-preserved medieval city centers in Europe with baroque restaurants, winding cobblestoned streets and iconic buildings. Round-trip route with on/off privileges in Stockholm! Comfortable double decker open top city shore excursion buses! Convenient stops near the cruise ship piers! Easy to use system map of Stockholm City! Audio narration on the bus - available in 10 languages! A total of 26 Bus stops at the must-see sites! Optional Boat Ride - See the price chart! See the exciting city of Stockholm in the most ironic way possible. 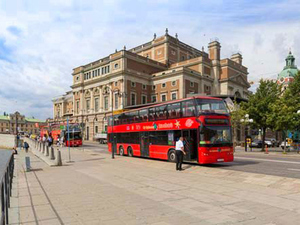 Ride on a double-decker sightseeing bus with great views on this picturesque Stockholm Excursion. You can ride the whole route or hop off at any of the stops, explore, and then hop back on. The buses run all day so there's minimal wait time.